England Under-17 winger Jadon Sancho made his Borussia Dortmund debut as the Bundesliga leaders drew with Eintracht Frankfurt. The £10m summer signing from Manchester City came on with eight minutes left but could not help his side find a winner. Dortmund remain top after a hugely entertaining draw, but only on goal difference from Bayern Munich - who beat Hamburg 1-0 later on Saturday. RB Leipzig - who beat Stuttgart 1-0 thanks to Marcel Sabitzer's goal - are one point behind the pair. Borussia Dortmund had led 2-0 through Nuri Sahin - who diverted Marc Bartra's wayward shot into the net - and Maximilian Philipp's shot from the edge of the box. But Frankfurt battled back thanks to a Sebastien Haller penalty and Marius Wolf's first Bundesliga goal - which came after he was picked out in space in the area. Sancho, who was recalled from the Under-17 World Cup during the week, replaced Philipp in the closing stages of the game. Elsewhere, Bayer Leverkusen won 5-1 at Borussia Monchengladbach and Hannover won 2-1 away to Augsburg. Match ends, Eintracht Frankfurt 2, Borussia Dortmund 2. Second Half ends, Eintracht Frankfurt 2, Borussia Dortmund 2. Attempt missed. Christian Pulisic (Borussia Dortmund) right footed shot from outside the box is close, but misses to the left. Assisted by Jadon Sancho. Marc Bartra (Borussia Dortmund) is shown the yellow card for a bad foul. Foul by Marc Bartra (Borussia Dortmund). Attempt blocked. Dan-Axel Zagadou (Borussia Dortmund) left footed shot from outside the box is blocked. Attempt blocked. Nuri Sahin (Borussia Dortmund) left footed shot from the right side of the six yard box is blocked. Attempt saved. Jadon Sancho (Borussia Dortmund) left footed shot from a difficult angle on the left is saved in the centre of the goal. Assisted by Jeremy Toljan. Foul by Branimir Hrgota (Eintracht Frankfurt). Attempt missed. Kevin-Prince Boateng (Eintracht Frankfurt) right footed shot from outside the box misses to the right. Corner, Eintracht Frankfurt. Conceded by Neven Subotic. Branimir Hrgota (Eintracht Frankfurt) wins a free kick in the attacking half. Substitution, Borussia Dortmund. Jadon Sancho replaces Maximilian Philipp. Attempt missed. Maximilian Philipp (Borussia Dortmund) right footed shot from outside the box is high and wide to the right. Assisted by Nuri Sahin. Attempt saved. Sébastien Haller (Eintracht Frankfurt) left footed shot from the centre of the box is saved in the centre of the goal. Assisted by Ante Rebic with a headed pass. Corner, Eintracht Frankfurt. Conceded by Shinji Kagawa. Attempt missed. Christian Pulisic (Borussia Dortmund) right footed shot from outside the box is just a bit too high following a corner. Substitution, Eintracht Frankfurt. Taleb Tawatha replaces Marius Wolf. Attempt blocked. Maximilian Philipp (Borussia Dortmund) left footed shot from the left side of the box is blocked. Assisted by Mario Götze. Attempt saved. Ante Rebic (Eintracht Frankfurt) right footed shot from outside the box is saved in the centre of the goal. Assisted by Carlos Salcedo. Attempt saved. Mijat Gacinovic (Eintracht Frankfurt) header from the centre of the box is saved in the centre of the goal. Assisted by Ante Rebic with a cross. Offside, Borussia Dortmund. Nuri Sahin tries a through ball, but Maximilian Philipp is caught offside. Goal! Eintracht Frankfurt 2, Borussia Dortmund 2. Marius Wolf (Eintracht Frankfurt) right footed shot from the centre of the box to the bottom left corner. Assisted by Mijat Gacinovic with a through ball. Corner, Borussia Dortmund. Conceded by Lukás Hrádecky. Attempt saved. Christian Pulisic (Borussia Dortmund) right footed shot from the centre of the box is saved in the centre of the goal. Assisted by Maximilian Philipp. Goal! Eintracht Frankfurt 1, Borussia Dortmund 2. Sébastien Haller (Eintracht Frankfurt) converts the penalty with a right footed shot to the top right corner. 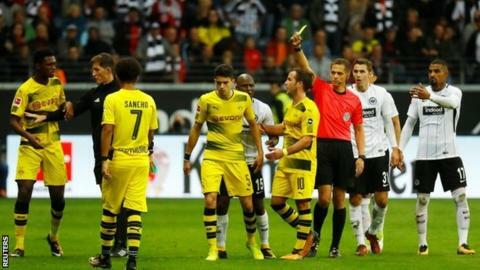 Roman Bürki (Borussia Dortmund) is shown the yellow card for a bad foul. Penalty conceded by Roman Bürki (Borussia Dortmund) after a foul in the penalty area. Penalty Eintracht Frankfurt. Ante Rebic draws a foul in the penalty area. Attempt missed. Ante Rebic (Eintracht Frankfurt) left footed shot from the centre of the box misses to the right. Assisted by Mijat Gacinovic with a cross following a fast break. Offside, Borussia Dortmund. Mario Götze tries a through ball, but Maximilian Philipp is caught offside. Corner, Eintracht Frankfurt. Conceded by Marc Bartra.